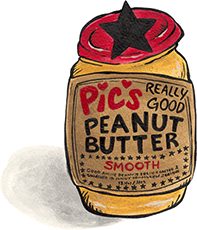 Pic's Peanut Butter for sale. Buy online at Zingerman's Mail Order. Gourmet Gifts. Food Gifts. The first “new” peanut butter we’ve offered beyond Michigan’s own Koeze’s. Instead of staying in state, we cast our peanut loving gaze across the Pacific to the magical land of Middle Earth—er, New Zealand. That’s where Pic (you gotta love Kiwi names) took his personal passion to eat peanut butter not loaded with sugar and created a spread worth spreading. He takes peanuts from Australia’s South Burnett region, roasts them in small batches, adds a pinch of salt and calls it good. We call it really, really good. Pic’s smooth variety isn’t the whipped supermarket stuff, but it’s a tad smoother than most specialty butters we’ve tried. Give the whole jar a stir to mix back in the peanut oil that can separate. Spread on a bagel and feel the high oleic, high protein, cholesterol free power of New Zealand peanut butter!